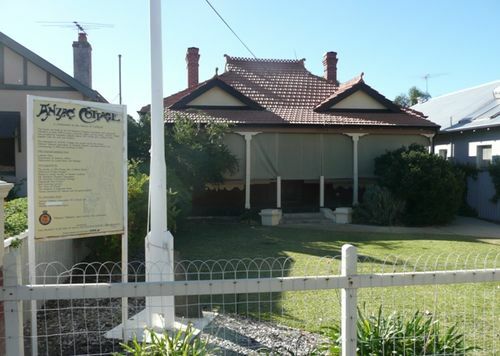 The ANZAC cottage commemorates the landing of Australian forces at Gallipoli in April 1915. It is Western Australia’s oldest World War One memorial, and unique because it is a house. Organised by the Mount Hawthorn Progress Association, it was erected to commemorate the landing of Australian Forces at Gallipoli on 25 April 1915. Seventy horse-drawn drays formed a half-mile procession in James Street on 5 February 1916 to cart donated materials to the cleared block. On Saturday 12 February, Mount Hawthorn was awoken at 3.30 am to the sounds of a ringing bell and a town crier: ‘Arise, arise! Anzac Cottage is to be built today’. Community spirit rallied over two hundred men to volunteer and dozens of women to serve hot meals as they toiled. Thousands watched the spectacle of a house being built in one day. Private John Porter was chosen as the recipient of the four-room bungalow. A soldier in the 11th Battalion, wounded on 25 April 1915, Porter was in the first contingent of diggers to return to Perth from the ill-fated campaign. The cottage was opened by the Premier Mr Scadden on the 17th April 1916.
on the 7th April 2002.